I've released a solo album of acoustic lap steel music. The 14 songs were recorded in July, 2014. There are no overdubs - it's purely a record of folk style playing on an old Harmony Stella guitar with a raised nut. 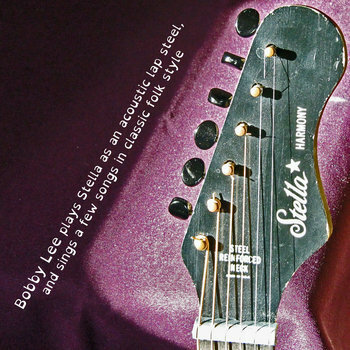 You can listen and buy it at b0blee.bandcamp.com/album/stella. I've started a new blog to host Bobbe Seymour's newsletter "Bobbe's Tips" plus some instrumental steel guitar music. It's updated frequently and it works well with iPhone and other mobile devices. Check it out at PedalSteelMusic.com. The Hawaiian Steel Guitar Association will hold its 25th annual convention Thursday Oct 6 through Oct 8 at the Holiday Inn Banquet and Conference Center, 411 S. Larkin Ave., Joliet, Illinois. This year’s guest from Honolulu is Greg Sardinha. Greg will be featured daily and will also perform at the Luau show on Saturday night. He is one of the most highly regarded steel guitar players in Hawaii, recently awarded the Hawaii Music Award for Steel Guitar Album of the Year. The 3-day convention fee is $45 or $15 daily, which includes entertainment, seminars, playing, and jam sessions. A memorable event for performers, collectors and lovers of Hawaiian steel guitars. Please register early! Details here. For more information, contact Don Weber at 815-351-2140 or Wally Pfeifer at 815-351-2740. There's another good article about this year's International Steel Guitar Convention on the Berklee Blog. Also, check out this report of an Al Perkins Recording Session. There's a good article about Ron Kyne and his trip to the ISGC at Harold-Mail.com. I missed his set (it was before I arrived), but it's nice to see pedal steel getting exposure in the press. Here's the list of performers and vendors for the International Steel Guitar Convention. The convention is being held at the Millenium Hotel in St. Louis, Missouri (USA). I'm sorry to say that I'll miss the Talent Search event, as my plane doesn't arrive until 4 PM. Other than that, I'm looking forward to a great show and a lot of meeting' & greetin' as I haven't been to the ISGC in several years. There were still rooms available as of August 10. We dropped Sunday, however, we may restate it at a later date. Dropping Sunday did give each of you an extra day to return home but some of you did miss no show being on Sunday. The Talent Search, Hawaiian show, Jazz show and Gospel will remain on the schedule time permitting. The latest information about the ISGC is always available online at SteelGuitarForum.com.